There really was a liberal media bubble, Nate Silver reports, and the only thing wrong with his assertion is that it's in the past tense. The lack of diversity among journalistic ranks—even the sort of racial and sexual diversity championed every day in the pages of the Washington Post and New York Times—makes it easy for consensus to form and harden into unshakable groupthink. The media is a crowd without wisdom. There is hardly any variety of opinion, independence of mind is mocked and ostracized, and reporters increasingly are twenty- and thirty-year-olds living in either New York City or D.C. who are addicted to Twitter, where they out-snark each other to determine who can assume the best pose of knowingness. "As a result," Silver concludes, "it can be largely arbitrary which storylines gain traction and which ones don't. What seems like a multiplicity of perspectives might just be one or two, duplicated many times over." Perspectives that Donald Trump is an oaf or Hitler or an oafish Hitler and Republicans are, in a word, awful. The remarkable thing is the bubble did not pop or even tremble after the election was over and the unthinkable had occurred. Instead it hardened into a shell, an impenetrable dome of the sort that walls off Chester's Mill, Maine, in the novel by Stephen King. We moved effortlessly from a world in which Brexit would not happen and Donald Trump could not win to a world in which Putin colluded with Trump's henchmen to influence the election and the Trump presidency was on life support after only 50 days. The hysteria and mob-like denunciations that greet every utterance of this president, each step taken by his team, have become routine. What has been normalized in these first two months is not Trump but the paranoid bad faith imputed to him. In Washington under Trump even so rudimentary an activity as eating has become politicized, weighted with aesthetic and class significance, put under the jurisdiction of social arbiters who declare what is woke and what is haram. 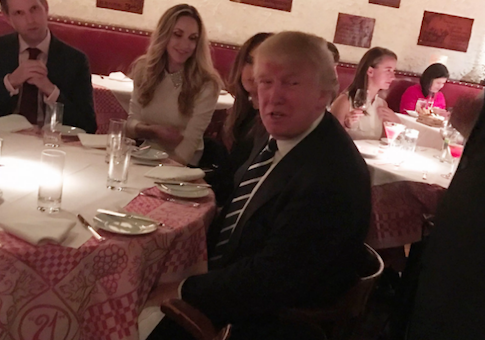 "Actually, How Donald Trump Eats His Steak Matters," proclaims a contributor to Eater.com. "The president of the United States insists that his steaks be cooked well-done. Unfortunately, that's a big problem." But why is it a problem, Eater.com? Why should so trivial a detail impress itself on the average person's consciousness for even a microsecond? Aren't there far more important subjects that warrant reflection and criticism and debate: health care, trade and tax policy, missile threats, the men and women dropping dead from heroin? This 1,800-word piece begins with the admission that "for almost every person in the world, it's totally okay to prefer your steak cooked all the way through." Except if his name is Donald Trump. In that case, "a person who won't eat his steak any doneness but well is a person who won't entertain the notion that there could be a better way; a person who blankets the whole thing in ketchup (a condiment that adds back much of the moisture, sweetness, and flavor that the overcooking removed in the first place) is always going to fix his problems by making them worse." What a wonderful example this sentence is of baseless, aimless generalization. Cooking a steak well and dipping it in ketchup is just the hook for an extended and self-indulgent riff into "this calculus of trust and risk" that ends, as all such riffs do, in an affirmation of the superior morality and taste of the writer. In this Manichean universe there are ketchup people and aioli people and the aioli people are, needless to say, ascendant. When the Times first reported last year that President Trump prefers his steak "so well done" that, in the words of his butler, "it would rock on the plate," I took it as another unusual detail in the unusual life of an unusual man. Let it not be said that Donald Trump lacks conviction: on matters of cuisine and decoration and foreign trade he is wedded to his beliefs, will not deviate from patterns established decades ago. Well-done steak with ketchup is an entrée from childhood, a comfort-food recipe Trump clearly has seen no reason to abandon in his 70 years of life on this planet. That's his business. No more important to his life, or to the life of this nation, than his tendency to wear white baseball caps when he is happy and red baseball caps when he is annoyed. Over the last year however the press has fixated on the steak and its accompaniment, returned to them again and again, fetishized them, contorted them into a metaphor for the childishness and vulgarity and gaucheness that Trump's opponents so despise. "Putting ketchup on his $54 steak drives a wedge between Trump and his fans," reports Marketwatch.com, citing a silly PPP poll in order to expel Trump from the in-group. Does Trump put "Bernaise? Chimichurri? Peppercorn?" on his steak? Negative. "Instead, Trump went with ketchup, that most pedestrian of all condiments." Lock him up! I am fascinated by the condescending use of "pedestrian," with its connotations of déclassement, to describe one of America's most popular condiments. What it suggests is that the fixation with Trump's manner of eating is in reality a fixation with the persistence of habits and attitudes and trends that the over-schooled and undereducated metropolitan producers of news and opinion do not like, deem retrograde, wish would recede into the past as humanity progresses toward its gender-neutral, multicultural, borderless, medium-rare steak au poivre future. "For real, Mr. President?" asks the Washington Post‘s food critic when confronted with Trump's menu choices. I have not read a more snobbish and self-congratulatory and clueless paragraph in some time. It portrays the city of Washington precisely as it exists in the minds of Trump's supporters: a cosmopolitan metropolis whose gluttonous, affluent, and power-mad residents dine out each night on fare prepared and served by low-wage immigrant labor, where you can find "even" an American restaurant, where manners are not only about holding properly a knife and fork but encompass the entirety of the restaurant you patronize, what you order, what sauces you dip your entrée in. The eye-rolling and fake outrage over such a meaningless topic says far more about the self-absorption and entitlement of the critics than it does about the president. "Trump eats $50 steak with ketchup, foodies aghast," reports SFGate.com. It is hard to read stories like these without coming to the conclusion that so much of our elite's abhorrence of Trump is a matter of aesthetics, of his not fitting in, of his stubborn devotion to practices and ideas deemed retrograde by opinion leaders but that still appeal to, oh, about half the country. As I read these stories I want nothing more than to run to the nearest steakhouse, order the filet well done, and dunk the bites in a raft of condiments, from ketchup to Tabasco to relish to mustard. Why not? It's still a free country. Just so long as you can find a way out of the bubble. This entry was posted in Columns and tagged Donald Trump, Media. Bookmark the permalink.